Referred to as “America’s Race,” the 2015 USA Pro Challenge took place August 17-23 - and Breckenridge was the finish town for the 4th stage, which started in Aspen. For the fifth, riders competed in an individual time trial along Highway 9, up to Breckenridge Heights along Moonstone Road, and back onto Main Street. The finish almost right in front of Breckenridge Associates Real Estate, which hosted another party and invited clients to hang out and watch the race. In general the Pro Challenge is seven consecutive days of bike racing, where the world’s top athletes climb and descend picturesque roads in the majestic Colorado Rockies, reaching higher altitudes than they’ve ever had to endure. The inaugural Women’s USA Pro Challenge is a three-day invitation-only event and that kicked off in Breckenridge on August 21, 2015 and concluded in Golden on August 23rd. One of the largest cycling events in U.S. history and the largest spectator event in the history of the state, the USA Pro Challenge 2015 featured a challenging course, for this, the fifth annual race. More information can be found online at www.prochallenge.com and on Twitter at @USAProChallenge. Breckenridge, Colo. (Aug. 22, 2014) – Stage 5 of the 2014 USA Pro Challenge took the riders on a challenging and soggy route from Woodland Park to Breckenridge where an attack in the last few miles of the race would takeLaurent Didier (LUX) of Trek Factory Racing all the way to the finish. Overall leader and defending champion Tejay van Garderen (USA) of BMC Racing Team held onto his 20 second lead and will wear the yellow jersey leading into the individual time trial tomorrow in Vail. While much of the Stage 2 course has been used in previous years, 2013 will mix things up by taking the riders in different directions, creating a unique new stage. The familiar battleground of Independence Pass will be anything but easy as riders ascend the 12,000 ft. climb, the highest point reached in any professional cycling race. Then they’ll continue on through some familiar spots as the race zooms through Buena Vista, Fairplay and Alma, before tackling Hoosier Pass from the south this year. But it’s not over until it’s over, so before crossing the line the riders will have to conquer the nasty 15 percent grade of Moonstone Rd. in the heart of Breckenridge, before bombing down Boreas Pass to the waiting crowd. Stage 3 will be difficult to predict for even the biggest cycling fans. Can the climbers hold off the field or can the sprinters hang on? Stage 3 of this year’s USA Pro Challenge is wide open for the taking. After leaving Breckenridge, Swan Mountain Rd. provides a great launch pad for breakaways as the riders weave north to Kremmling, but it’s all just a prelude to the day’s main showdown on Rabbit Ears Pass. Climbing the challenging eastern slope will give the climbers a chance, but they will have to hold off the sprinters for 20 miles after cresting the top as they head downtown Steamboat Springs. Can they do it? Or will there be a repeat of 2011’s thrilling and monstrous field sprint? 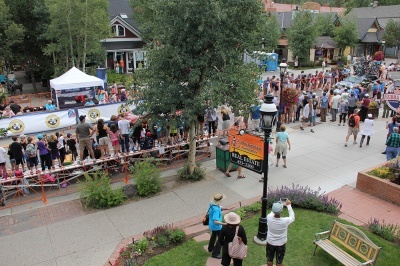 Day Five of the Pro Cycling Challenge begins in Breckenridge and a swarm of bikes will cover Main Street, move incredibly fast up the Blue River Valley and climb Hoosier Pass covering 118 miles before crossing the finish line in the Garden of the Gods. If you watch the Tour de France for the scenery, the US Pro Cycling Challenge is your kind of bike race. For seven days at the end of August, the same cyclist who ride Le Tour climb and descend the mountains of Colorado, and on Day 5, cameras will roll above and along with these riders from Breck to Colorado Springs. Just imagine a line of moving bicycles emphasizing the graceful bend in the Blue River as seen from the hill near Bekkedal. What will they look like from Rocky Point, up on Boreas Pass? Or near the Blue River Town Hall, and as they make that first switchback up the pass in Tordal Estates? As they crest the pass? The road will be closed to traffic for a few minutes, so alternate routes like Boreas Pass Road, or Gold King on the west side will be good ways to get back from a good viewing spot. Hiking the Burro Trail, or Silver Queen Road from Warriors Mark may also be a pleasant way to find a vantage point. The view of this race will be incredible from any of the real estate south of Breckenridge. Highway 9 is the major artery, and so it should not be hard to find a picnic spot in the neighborhood with just the angle you want. Colorado has hosted several big bike races like the Red Zinger of the 1970s and the Saturn Series from 1999 to 2001. Filmmakers captured the scene in movies like American Flyer, and spectators come out on foot, in cars and on bikes to see these. Once you’ve seen a race like this in person it makes the television coverage so much more interesting. If you want a view like LeTour in the Alps, pick any spot along the route from Breckenridge to Hoosier Pass; or south of the pass down into Fairplay if open mountain parks are your thing. The next day, August 21, these pros ride across two picturesque summits skirting the chain of lakes between Montrose to Gunnison, past ranch lands and up into the alpine terrain of Crested Butte. A steep two mile finish between town and Mount Crested Butte was an exciting moment in the 2011 Challenge, when last year’s winner Levi Leipheimer took the lead. Third day, 130 miles and the two highest passes of any bike ride in the world – Gunnison to Aspen. On the fourth day, riders will again climb Independence Pass, descend by Twin Lakes – reversing the ride they will have done the day before – make the long steady stretch into 10,000 foot high Leadville. After a run through town, the riders will cross the Continental Divide at Tennessee Pass in the wide alpine valley that will get very curvy around Battle Mountain, Red Cliff and eventually descend into Minturn following along the Eagle River and down valley toward Avon, where they’ll take on the final short climb up Beaver Creek. THE FIFTH DAY BEGINS IN BRECKENRIDGE where riders take off up Hoosier Pass and another pass over the Continental Divide, and then the rolling hills of South Park and up Wilkerson Pass into Woodland Park, over Ute Pass, down into Colorado Springs with a finish in the Garden of the Gods. Golden to Boulder on Highway 93, up Boulder Canyon to Nederland along the Peak to Peak Highway to Lyons, back down to Boulder, up Left Hand Canyon and back into town. August 26th. Time Trial Finish from Downtown Denver to City Park and back.